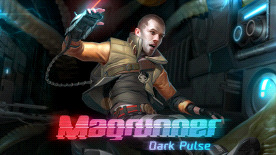 ©Magrunner: Dark Pulse. Copyright 2012-2015. 3 AM Games. 3 AM Games is a studio of Frogwares. 3 AM Games and Frogwares are trademarks of Frogwares. All other trademarks or registered trademarks belong to their respective owners. All rights reserved. Powered by Unreal Technology. Unreal® is a registered trademark of Epic Games, Inc. Unreal® Engine, Copyright 1998 – 2015, Epic Games, Inc.